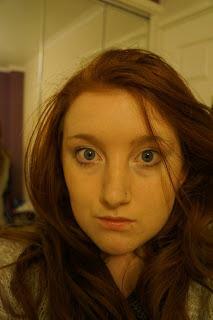 I hadn't tried a highlighter before, but I have read many blogs recommending using highlighter, and I was keen to try one. 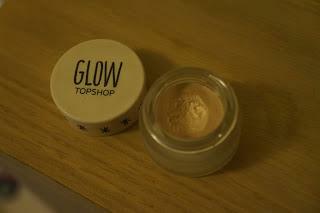 Topshop's Glow wasn't one I had read anything about, but it caught my eye when I was in the queue and on an impulse I bought it. I was first attracted to the packaging, it comes in a pretty frosted glass pot, with the recognisable white plastic lid with stars drawn on in pencil style which is typical of topshop's beauty products. Whilst the pot does look quite small considering that the price is £9, but I have found since buying it, a little goes a long way and I think the small pot is going to last a very long time! 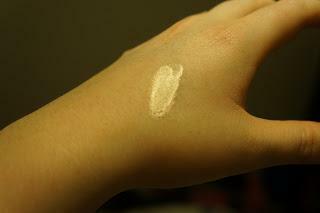 I think you can tell in the above two pictures that it's got a lovely shimmer to it, which helps to brighten your face, and it's creamy consistency makes it easy to apply and blend. 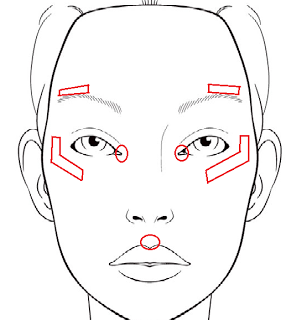 This product looks great if you apply it just under the eye on top of your cheeks, above your eyebrows, and a little dabbed on both your Cupid's bow, and on your inside tear ducts as i've shown below using red lines! I apologize for my poor Paint skills, ha! At £9 a pop this product is quite expensive, but I would recommend it, it's great for both natural and heavier looks, as it is effective in adding a little brightness to your face! Definitely worth a buy. 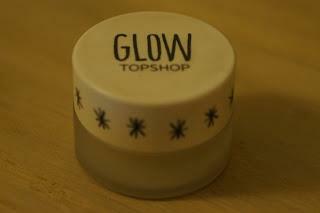 Have you tried Topshop 'Glow'? What did you think? Do you recommend any other Highlighters?